I have a habit of not completing seasonal projects lol love your charm square quilt finish! Your Christmas quilt is wonderful Valerie! I wish you a Merry Christmas. Christmas Charms looks very festive. Have a very Merry Christmas. Love your beautiful quilt! Perfect room to have visions of sugarplums! What a neat Christmas quilt Val!! That is something I have never made yet. Merry Christmas to Jackson also!! What a neat pantograph! Beautiful quilt Val - and Jackson approved! PS. the link in your comment you left, leads to blogger's site and not to your blog. Seasonal quilts for the master bedroom sounds like a fun long term project. You can keep adding seasons. 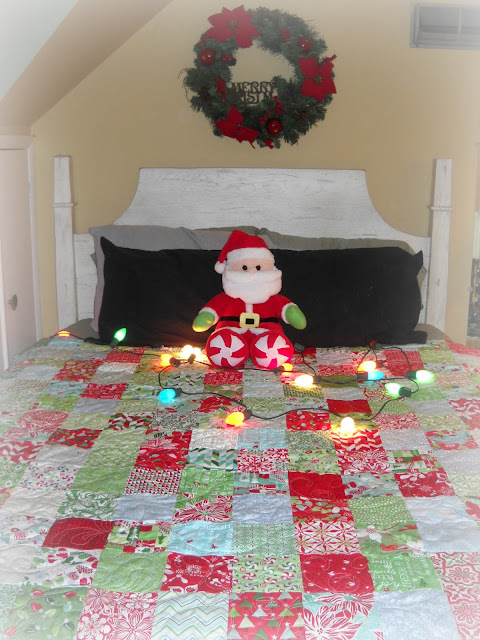 :-) The Christmas quilt looks good on the bed. Have a wonderful holiday Val! All of these Christmas quilts are so festive. Merry Christmas Jackson and family. Happy New Year. Oh I love how it came out. Congrats on getting it finished so fast.